Ford has made it clear that the company is working on a variety of electrified models for the near future, including an all-electric, Mustang-inspired sport utility vehicle and a hybrid version of the legendary pony car itself. Unfortunately, while we know that there is a Mustang-inspired electric SUV and a Mustang hybrid – possibly with a V8 engine – the Motor Company hasn’t offered up any idea as to what these new models might be called when they arrive in showrooms. The Mustang-inspired SUV was referred to as the “Mach 1” for a short time, but the company got a ton of backlash for repurposing a legendary performance car moniker for an electric SUV, so that name was seemingly scrapped. However, filings with the United States and European trademark departments suggest that the “Mach” name is alive and well, possibly with planned use on the electric SUV and the hybrid Mustang. Back in December, it was discovered that Ford Motor Company had filed paperwork for the name “Mach-E” in the United States and Europe. After Ford fans made it clear that Mach 1 would not be ok, perhaps the automaker switched their naming approach to Mach-E, even if only for internal or concept use. I still don’t know that it is a great name for an electric SUV, but perhaps the vehicle will perform so wonderfully that the name won’t make any difference. In any case, the newer information comes from AllFordMustangs.com, who have reported that the Motor Company has filed for a trademark of the name “Mustang Mach-E” in Europe. This name could be protected for one of three reasons – a concept car, the hybrid version of the Mustang or the Mustang-inspired electric crossover. While there is no chance of the electric SUV being called a Mustang in the US market, it is feasible (although unlikely) that Ford could use the Mustang name overseas to help spur sales of the performance-minded electric SUV. This is a longshot, but with this filing applying to the European market, the company could take some bigger risks with the name. Next, the Mustang Mach-E could be the name of a concept car and nothing more. Even if this concept car is similar to what eventually becomes the hybrid Mustang, there is a chance that Ford won’t use the “Mach” naming direction at all and the trademark filing could simply be in place to protect the name. Finally, the most likely possibility for the Mustang Mach-E name is that it will be the trim level name for the hybrid pony car. Imagine if Ford does use Mach-E for the Mustang-inspired, all-electric SUV, calling the hybrid pony car the Mustang Mach-E would make sense, especially if the company plans to use the Mach name on other performance-minded electrified vehicles. 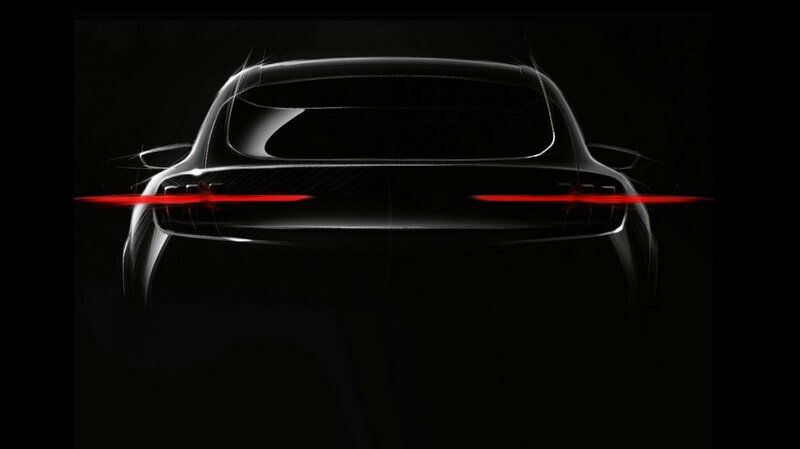 It could be that Ford has chosen the Mach-E moniker to be the model lineup that denotes it's electrified performance cars. In a similar way that Audi has their E-Tron lineup. So it might me that the introductory Mach E is their Mustang influenced BEV crossover, with Mustang styling influences. And the Mustang Mach E is the performance hybrid that you mentioned. From the looks of the patent design they could potentially have 4, 6, and 8 cylinder versions with AWD and regular hybrid and PHEV variants. From my view Ford cannot release these EV models too soon.